Planting and cultivating an herb garden is perfect for Southern California homeowners whose yards enjoy bright sun and practically perfect growing conditions year round. Herbs are also ideal additions to any gardener’s line-up because they complement nearly every dish, can be infused into cocktails for entertaining, and are used for a bevy of healing and beauty treatments. Speaking of the latter, it’s easier than you might think to grow the ingredients for these treatments – you just need to know what’s used for what, and you’ll have your own natural medicine cabinet – outside. Meanwhile, please note: the below information should not be taken as medical advice. For a specific health problem, consult your doctor, especially if you are pregnant or breastfeeding. Also be aware that some herbs may interact with prescription drugs. The author and publishers of this site cannot accept responsibility for any results of the below remedies included in this article. Now with the disclaimer out of the way, below are some popular healing herbs and how to use them. Chamomile has long been used in teas to promote better sleep. This popular herb can also treat anxiety, indigestion and when used in salves, for skin inflammations. If you have hay fever or ragweed allergies, know that chamomile can exacerbate your symptoms because those plants are related to each other. German chamomile is an annual plant and can grow as high as three feet, so allow for that space in your garden. 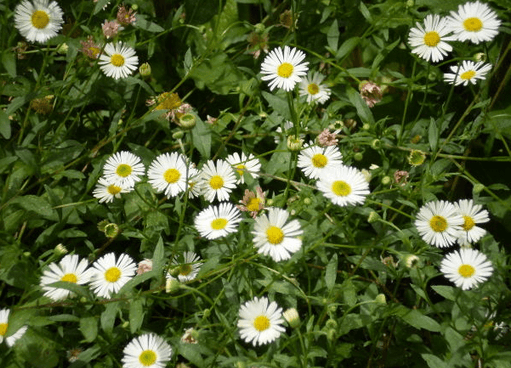 Full sun, occasional watering, and light sandy soil is best for chamomile. Most chamomile plants will show flowers after a month of planting in your garden or containers. Many gardeners choose container planters for chamomile because the plant tends to spread and can get out of control. Harvest and dry the chamomile flower blossoms for tea. If you prefer to enjoy fresh chamomile blossoms in your tea use two teaspoons to brew as opposed to one teaspoon of dried flowers. Lemon balm is another sleep-promoting herb. A member of the mint family, aromatic lemon balm is generally considered a calming herb and eases indigestion and stress. Lemon balm has also been used to heal wounds and treat insect bites or stings. Lemon balm is a perennial that grows well in full sun to partial shade conditions. Lemon balm also prefers moist but well-drained clay or sandy soil. The herb will usually be full-leafed within 10 weeks of planting and can grow between two to three get high. Cutting the plant back usually results in lemon balm rejuvenating itself with new growth – and sometimes coming back twice as thick. 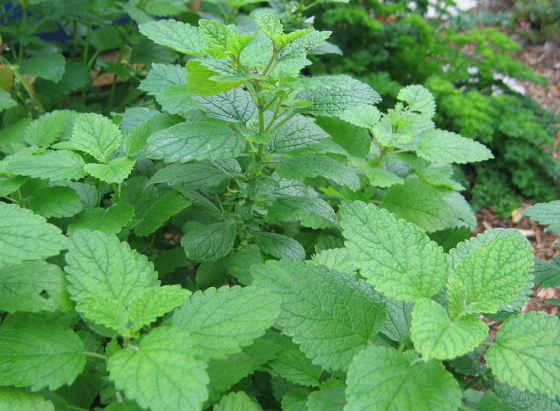 Lemon balm prefers fertilizer rich in organic nutrients. Lemon balm can be an invasive plant that grows everywhere, so you may want to grow it in containers or in a separate garden bed. People harvest lemon balm’s leaves and stems for tea or in organic oils for its calming, anti-viral and anti-bacterial benefits. For tea, pick a bunch of the leaves before flowering (lemon balm leaves are best when used fresh and not dried first) and wash in cool water. Put the leaves in a mason jar and fill it with boiling water then crush the leaves with a wooden spoon. Strain the water for tea. Mullein is an easily grown herb often used in alternative medicine to treat sore throats, dry coughs, and ear aches. 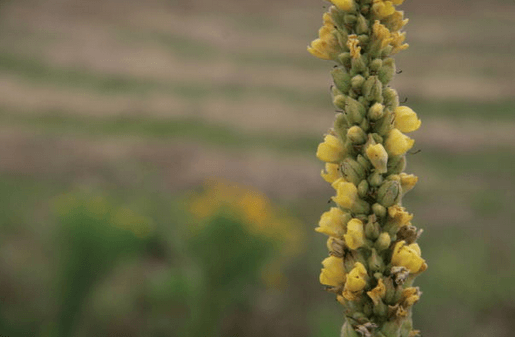 Known to loosen mucus, mullein is also considered an expectorant and inflammation fighter. Mullein is a biennial that prefers well-drained soils and full sun. Because birds tend to go for mullein seeds if they’re planted outdoors, it’s suggested that seedlings be started indoors and transplanted in the garden after leaves have sprouted. Mullein’s flower spikes can reach up to six feet, so the plants need plenty of room to grow. Flowers don’t appear on the mullein plant until a year after transplant, and the plant can be harvested when the entire plant is in bloom. One teaspoon of dried mullein can be used for a cup of tea – but strain the water well to remove all mullein bits before drinking. One ounce of mullein to a pint of boiling water – again well strained – can be used to treat coughs and mullein oil (place flowers in olive oil in a corked bottle and let sit for several days) treats ear aches (many people report that two drops of oil in the infected ear two times a day works well). Lavender is often used in essential oils and creams as a stress-buster and tension-alleviator. 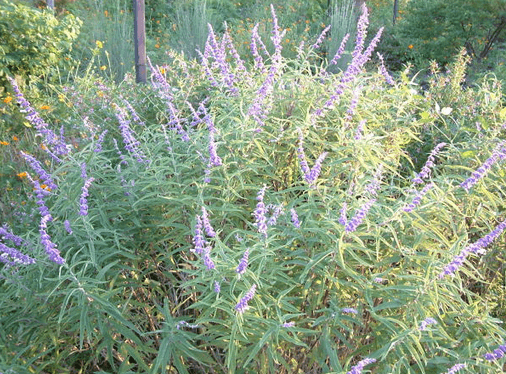 The herb has also been used to treat gastrointestinal upset. Another perfect-for-San-Diego-weather herb, lavender is best grown in hot, dry and sunny climates. Lavender grows in a shrub formation and is a pretty addition to yards and gardens. Plant in a fairly open area in drained, mildly alkaline soil. Adding sand to the soil will help drainage, which is a plus because lavender doesn’t like excessive moisture. To that end, don’t over water the plants and allow the soil to dry before watering again. Lavender is harvested when you cut its stems from the plant. Either dry the flowers by hanging a bunch upside down in a dry, dark, and ventilated area (to preserve color) or use the dried blossoms in tea. Add one tablespoon of dried lavender (or two tablespoons of fresh) to boiling water and let the tea steep for about five minutes. Then, strain the herbs and pour the tea into a cup to enjoy. You can also make a lavender extract to add to lotions or as to water to help promote sleep by adding four ounces of chopped fresh flowers (or two ounces of dried) and adding them to a quart-sized glass jar and pouring enough vegetable glycerin or 100-proof alcohol (vodka or brandy) to cover two inches above the herbs. Stir well, cover and shake and allow the lavender to sit in the sun for up to six weeks, while being sure to shake the jar daily. Strain the mixture, keep it in an amber-colored glass bottle and store in a cool, dark place for up to two years. Echinacea is as healthy as it is beautiful. Typically used as an immune-booster, Echinacea purpurea – or Purple Coneflower – sprout big colorful flowers when in bloom. Echinacea grows well from seed and can be planted in a garden or container. Plant the seeds in a moist, sun-filled spot and allow them plenty of room to grow. Fresh echinacea is best for medicinal use, and tinctures seem to be the mode of choice for many health enthusiasts. Use a 1:10 herb/alcohol ratio when concocting your tincture, for example adding one ounce of fresh echinacea to 10 oz. of high-proof alcohol (above 100-proof is best). Mix both in a clean, glass jar, cap it and let the whole thing sit in a cool, dark place for up to two weeks. Shake the jar several times a day and when ready, strain the herbs through muslin or other similar material. Bottle the tincture in an amber glass. It’s suggested that you use up to 30 drops three times a day to prevent or shorten colds – but start slow to see how you adapt to the tincture. 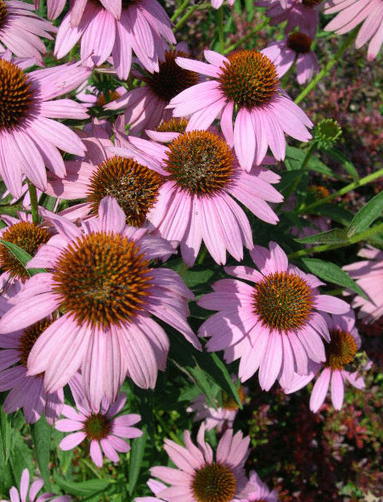 Echinacea is best to take the moment your symptoms appear rather than when you’re already sick. For herbal teas, bring water to a boil while you add two tablespoons of fresh herb – or one tablespoon of dried per cup of water – to an empty glass jar or pot. Add an additional serving of the herbs to the pot (e.g., two tablespoons of fresh or one of dried). Pour the hot water over the herbs and allow them to steep for up to five minutes. When you’re ready to drink, strain the herbs and pour the tea into a cup. A tincture is prepared by soaking fresh or ground herbs in alcohol and allowing to sit for two to six weeks so the plant’s properties are extracted and preserved. Either grind dried herbs or chop fresh herbs and place them in a quart-sized glass jar and pour with vodka or pure-grain alcohol until it reaches at least two inches above the herbs, cover it and let the mixture sit for at least two weeks, shaking daily. When you’re ready, strain the jar’s contents with a thin cloth such as muslin, and then strain again a day later. Store the tincture in a dark bottle in a cool, dark place and keep for up to one year (or even two in some cases). Tinctures can usually be taken internally when diluted with water or can be applied directly to the skin, depending on the herb and its intended effect. Poultices are mashed-up whole herbs applied as a paste to an affected skin area. The plant material can be mashed with water and honey, and applied to the area you want to treat; or if you’re using a “spicy” herb, it’s best to use several layers of muslin between the paste and your skin to prevent irritation. Often, the plant paste is placed in a cloth bag before applied to the skin, and this is preferred especially if you don’t know how you’ll react to the poultice. Poultices allow herbs’ healing properties to be absorbed by the skin and are used to treat inflammation and speed healing of cuts, bruises and sores. Often used for aromatherapy, oils infused with herbs can be made into massage oils or healing balms and creams. Lavender and chamomile lend themselves especially well to infused oils. Dried or fresh plants can be used and both should be cut to fill a dry glass jar. Cover the herbs with an oil such as olive, sunflower, or almond and be sure to fill the glass to the top to eliminate air bubbles. Stir the jar’s contents together to get rid of all bubbles and cap the jar. Leave the infusion somewhere warm and stir the mixture every day for the first 14 days, then allow to fully infuse for an additional two to four weeks. Strain the oil through a cheesecloth and store in a cool place with a label titled with the herb and date. Infused oils can be used to make salves and balms fairly easily. To make a salve, add two tablespoons of melted beeswax (available in health food stores or online) to a cup of gently warmed infused oil (melt beeswax over a low flame because it is flammable). Mix the two substances together and add some vitamin E as a preservative. Adding glycerin can smooth out the salve if you are using it for skin creams. One of the advantages of growing herbs for gardeners is that many are easy to plant and nurture. Plus, why go to the store to buy these common health remedies when you can grow them in your own yard? Do you grow your own herbs for their healing properties? The information in this feature is for example, only. For a specific health problem, consult your physician for guidance. Before using any of these remedies, especially if you have an existing medical condition, or are pregnant or breast-feeding, check with your physician. The author cannot accept responsibility for any damage incurred as a result of any of the therapeutic methods contained in this work. Photos courtesy of: By Datkins (Own work) [CC-BY-3.0 (http://creativecommons.org/licenses/by/3.0)], via Wikimedia Commons (lemon balm); Morgue File.com (chamomile, mullein, lavender, and echinacea).